Sixty plus years (as of 2006) of continuous service is a long time and quite an accomplishment for any organization, particularly a Pipe Band. Initially formed in 1945, it wasn’t until 1946 that the pipes and drums of Branch 28 marched forth in the tartan it still wears today, the Stewart of Fingask. Pipers John MacDonald, Sandy Kennedy, Rodger Brown, George Simms, Bill Hamilton, Ken Hamilton, Harry Brown, Charlie Pollock, George MacDonald and Ken Kenny. Drummers Glen Pearson, Bill Turkington, Bill Laurie, Bobby Patterson, Jim Haynes and Len Sketcher. 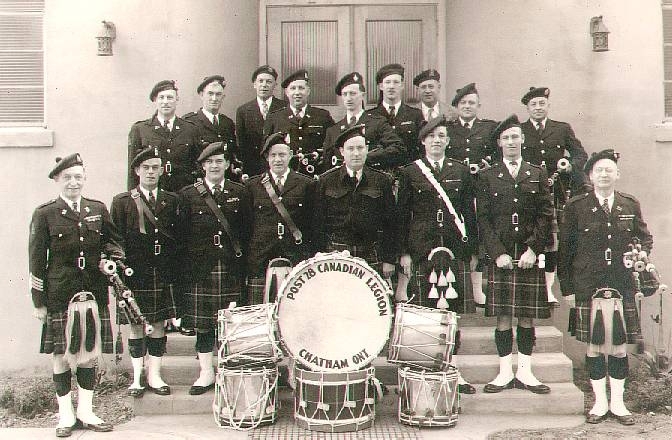 In 1962, a Junior Pipe Band was formed by Comrade George MacDonald and it was from this group the Senior Band was able to maintain its supply of excellent pipers and drummers. The fact that three of the Junior Band pipers have gone on to become Pipe Major of the Senior Band speaks well for them and their instructors. Throughout the years following its formation, Branch 28 Pipe Band has performed in parades across Ontario, Quebec, and the neighbouring states of Michigan and Ohio. Thousands of miles have been marched and countless hours of music have been played. The band has participated at numerous Zone, District, Provincial and Dominion Legion conventions. It has represented Canada in the Mardi Gras parade in New Orleans on two occasions, 1968 and 1994. On both occasions, it had the honour of being invited and was the only pipe band to participate. In April of 2002, the pipe band participated in the Scotland Power Tartan Day celebrations in New York City. The band, along with over 7000 other pipers and drummers marched down 6th Ave. (Avenue of The Americas) and into Central Park. The event was twofold: one to celebrate Tartan Day, and two, to raise money for cancer research through the Gilda Radner House. Members of the band have also taken part in the 55th and 60th anniversaries of the liberation of Holland. The Royal Canadian Legion Branch 28 Pipe Band has the distinct honour of being one of the oldest, continuously active Legion Pipe Band in the province of Ontario.